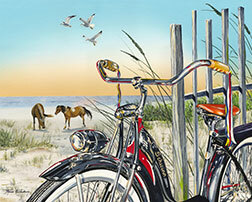 For detailed information on the Sea Gull Century please visit www.seagullcentury.org. From April 16th through April 23rd, everything in the store will be 25% off! We cover all purchases with a 30 day money back guarantee. Please open and inspect all items upon receipt. Any damages must be reported within 7 days. All returned items must be in the original condition w/ packaging. Please enclose a note of statement on reasoning of return. Email or call us to obtain your return authorization number. Return shipping is at the customer's expense. Shipping and handling fees will not be refunded. For your protection, you may wish to insure the package when you mail or ship it back to us. BCA is not responsible for the loss of or damage to any returned merchandise. Items that are received with shipping damage will be replaced with the same item at no charge. If no replacement is desired, regular return guidelines will apply. Please allow approximately 15 days for credits to be processed.